The results of the present investigations on Calderone Glacier derive from analyses and researches carried out by the writer through a twenty-year period, during which many surveys were repeated in all seasons, with the support of archives and the consultation of documents related to past and recent researches. Moreover we will try to address some little known aspects, mainly emerging from a careful examination of historical images. We analyzed many different sources: magazines, local publications, old cards and, more recently, the web. We have tracked one than 200 images belonging to the period 1871-2005. To this number, we must add the pictures I took personally since May 1983. Unfortunately it was impossible to recover the Dino Tonini archives containing the photographs taken from 1929 to 1960. In the scientific and amateur world, Calderone has been known for more than 400 years (De Marchi, 1573), but only by the end of the 19th century and the beginning of the 20th, together with the growing interest in geological sciences of that period, the glacier became a subject of study and observations, although in the beginning it was classified as a snowfield. The historical bibliography is very rich, already extensively dealt with by other researchers of this sector (Alberti, 1960; Tonini, 1961; Smiraglia, 1992), to whom the reader is referred for further investigation. The site once hosting the glacier is located on the North side of Corno Grande (2912 m), whose massif is made up of calcareous dolomites of Jurassic (Lias) and Cretaceous age. This side of the mountain is carved by a beautiful glacial rinnenkarren feature, Vallone delle Cornacchie, a glacial step-shaped valley, located within the ranges of Corno Grande and Corno Piccolo (2655 m). The cirques that hosted Calderone are located at the head of the valley between 2640 and 2870 m of altitude, extending almost as high as the highest peak, open towards N and NE and showing well developed walls and sides (ROVELLI, 1985). The thresholds are well marked, especially the lower one, on which a mighty morainic arc leans, still holding in its inner core blocks of buried ice. The lowest point, corresponding to the sinkhole, is approximately set at 2630 m. Superficial karstic phenomena have played an important role in defining the shape of the lower cirque (photo 1). The entire moraine rests on the fault which runs across the northern ramparts of Corno Grande, from Sella dei due Corni to the Eastern Peak and, in the area of the glacial cirque, sets its limit. The sinkhole of the glacier has formed along the slickenside. The morainic complex shall not be completely attributed to the maximum ice expansion of the 19th century GlRAUDl, 2000) as it is stratified in different layers. It is worth noting the small diversion apparatus that the moraine chain shows on the hydrographical left (Smiraglia, 1992; GlRAUDl, 2000). In the lowest spot of the lower cirque, close to the sinkhole, a small epiglacial pond (Lake Sophia) was present till 1995; its persistence depended on the overflow of melted snow during the summer heat waves. The pond was observed for the first time in 1929. Nevertheless, water levels can be noted in images of the late 19th century, such as the photographs by Tenerani (photo 3). This frame also shows a bediere, hidden by a temporary snow patch, and the northern apex of a moraine laid in the second half of the 19th century, better visible in photo 10a of 1887 arrow) and 2 (1916). Photo 1: aerial view of Calderone circuses with the three peaks: 1) Como Grande, West peak (2912 m); 2) Forchetta del Calderone; 3) Como Grande, Centre peak (2875 m); 4) Como Grande, East peak (2903 m); A) Conca degli Invalidi Circus, West ridge; B) upper circus threshold and rocky window; C) outer snow field and Calderone right-median moraine; D) outer canal of the glacier fossil emissary; black spot on the ridge of East peak; writer’s photographic station. (Avio Club, L’Aquila, August 2003). The following summary is listing the factors affecting the permanence, or the disappearance, of the old snow feeding the glacier, thus conditioning its survival. Mediterranean climate, with concentrations of falls in the winter semester. Mediterranean climate, with hot and dry summers. The glacier exposure was predominantly N/NE, with secondary E/SE, S, W and NW exposures. Actually, the axis of the glacier had a parabolic shape with a northward curvature. The small size of Calderone, approximately 100.000 m2 during the maximum extension of the 19th century; 70.000 m2in 1917; 61.000 m2 in 1970 and 45.000 m2in 1992, was no obstacle in building up many of the typical features of larger glaciers; the apparatus indeed was always rich in crevasses, particularly in the shrinking periods, at least in the first years of reverse trends. Superficial shading and consistent tables development was also frequent. With rare exceptions, such as those resulting from 1913, 1918-22, and 1935 photographs, showing a prevailing snow coverage along the hydrographic right side, all the remaining 20th century surveys show the prevailing residual coverage on the left side. This leads to identify this configuration as typical of the long shrinking period of this century, since the old images of 19th century show a substantial balance on both sides and a less marked glacial concavity (Marinelli & Ricci, 1910). The feeding sector, with a lesser slant, was limited to a small portion of the upper basin, insufficient to justify the overall size of the glacier, though sufficient for a glacier restricted to the upper cirque only. The thickness of the snow cover on the glacier has nearly always been important. The measurements carried out in June by SMIRAGL1A, Pecci (op. cit.) et al. confirmed that Calderone glacier receives huge amounts of snow each year, not justified by meteoric falls that add up to approximately 1600 mm per annum (Tonini, op. cit.). With the exception of a few winters with scanty falls, such as the 1980-90 decade, in normal years the snow coverage of both cirques is plentiful. The 8-10 m of snow measured in May-June 2003-2004 are the result of cumulative falls of 15-20 m of fresh snow, an amount definitely in conflict with the 3-4 m evaluated by ToNINI (op. cit.). Thus other factors have to be taken into account to justify such high values: firstly the snow capture by Calderone cirques, open toward N-NW, an important feeding factor (the ice detachment from the walls is a direct confirmation) which however is not the only one that allowed the glacier to survive till the 21st century (indeed it acted upon the right rocky side only). Secondly, the aeolian transport, representing a fundamental accumulation factor for the upper portion of the glacier. According to spot surveys carried out by the Author over the last twenty years, the two sectors of the former glacier are fed in different ways. The upper sector, far from being fed by snow capture only, receives mostly direct falls and substantial accumulation caused by W and NW winds (photo 5). Such winds sweep the snow from the steep slopes of the adjacent lower Conca degli Invalidi cirque and from the West ridge of the peak, transporting it into the upper basin of the glacier, overtaking the saddle just below Corno Grande (photo 6). In this way the glacier builds up a characteristic pile and the typical asymmetric look of the two sides of the feeding basin; these features, not known to exist from the maximum expansion periods till the twenties, became more and more evident as the glacier shrunk and insisted predominantly on the left side, fed by the leeward West winds (photo 6, 7, 8). Aeolian transport is clearly visible in photos, cards and other images taken in clear, windy days and is further confirmed by observing the glacier in the eighties, when two independent feeding systems originated in two different sectors of the upper basin, though the right one was about to vanish already (photo 2b). Further confirmation is given by examining the residual snow coverage of the right side of the suspended cirque in the Conca, degli lnvalidi\ though technically fit to host snow fields throughout the summer season, this sector is already empty in June, with no snow cornices on the ridges, thus confirming a mass transfer towards the glacial r-ea. Moreover, in spite of a most favourable geographical context, surprisingly enough a snow cornice is often absent from the ridge separating Calderone cirques from the Invalidi cirque, being present only sporadically ^nd having a size smaller than one would expect. The lower sector, on the contrary, was fed by the capturing process of the walls emerging from the upper part, by avalanches conveyed from three different channels carved in the walls (photo 3), as well as by huge leeward accumulations along the left lower margin. Photo 2 (a, b, c, d): comparison between 1916 (Marinelli, Ricci), 1970 (Zanon), 1987 (Rovelli) and 2003(Bartolini). A definite volume reduction is evident, particularly in the accumulation area and in the median part, disappeared in 2003. To be noted, in the image of 1916, the median moraine left behind in the advance of second half of 19th century, also visible in photo 10, with the carving of deflux canal. In the image of 1987 (2c) the shading feature shows the two flow streams in the upper basin. In the image of 1979 the glacier is advancing, but it also shows that this phase is limited to the left-upper side. Photo 3: view of the glacier from West Como Grande peak before 1890 (Tenerani). The area delimited by the circle shows a water puddle close to the sink. Clearly visible on the left the glacierfront, in an advancedposition never recorded subsequently. 1) East peak; 2) Centre peak; 3) rocks alignment. Possibly a small moraine left in the expansion apex, now no longer in existence; 4) main photographic station of the writer. A) canal of Forchetta Gualerzi; B) canal of Forchetta Sivitilli, C) third canal; D) snow deposit on Terrazzone connected to the glacier; E) rillfurrow filled with snow. The Aeolian accumulation on Calderone was more relevant when the ridges emerged from the glacier; thus, in r^riods of consistent shrinkage, this way of feeding contributed to lessening the effect of scarce snowfalls, at cast on the left side. This peculiarity allows a good determination of the date in which the limit of the ‘nowline constantly rose above the upper glacial level, and that time can be set approximately in 1940, a year f unusual snow accumulations. The same date marks the glacier’s turning point from existence to survival. After the remarkable progress of 1940, Calderone went into a strong recession phase, but survived thanks to s»me local orographic factors, though it could no longer rely on contributions from its feeding basin, as the j’.acial dynamic unity was progressively lost; in the same way, the progressively diminishing snow capture was documented by its detachment from the rocky walls on the hydrographic right. The loss of ice thickness in the median part (since 1934), formerly evaluated in 25 m by Tonini (1961), confirms the above analysis, if we take into account the withdrawal of the front (- 7 m) and the (apparent) stability of the upper basin. Furthermore, from 1940 onward, the snow accumulation at the front (particularly in 1954, 1983, 2005) and the presence of Lake Sophia became the rule. In the topographic surveys carried out at first by Marinelli and Ricci (1917) then by Tonini (1933, 1934, 1958, 1960), one notes a loss of volume and the trend of the glacier to lean over the right side before 1950 and over the left side after that date . Also visible is the increasing slant of the portion between mid and front area of the upper cirque, due to the sizable shrinkage which would lead to the separation of the two ice masses: a glacier within a glacier. In a few words, a situation similar to that of many glaciers of the Central Alps, such as Bondone, Pioda, etc, was developing for Calderone. Another clear symptom of the rising snow-line, over the highest peaks of Gran Sasso, is the different distribution of residual snow cover through the years. In many images dated between the end of thel9th century and the beginning of the 20th, one could easily locate both the annual snow-line and ELA on the glacial surface as there was a uniform distribution of the residual snow cover; after 1940, when present, the residual coverage was irregular, resulting in a discontinuous accumulation, typical of non-glacial area but proper for periglacial sites. Often, the snow coverage was limited to the upper left side (photo 12b) and to the terminus . while in the first years of 1900, the snow capture was well distributed along the whole glacier’s right side, reaching just below the Vetta Centrale. In summary, until 1940 such a configuration was typical of the area outside the cirques hosting the glacier, or even of the glacieret band of Vallone delle Cornacchie (2550-2700 m). Later on the whole band shifted upward, leaving the glacieret band occupied by increasingly unstable snowfields and both Calderone cirques scaled down from glacial to periglacial sites. The process was a slow one, with an intermediate phase between 1930 and 1950. Further confirmation can be found in the relation between glacierets and snow patches of Yallone delle Cornacchie and the glacier itself: since mid-20th century, ample snowfields often show up while the glacier is totally naked. In the years of plentiful snow for the snowfields, a marked accumulation occurs on the inner side of the moraine and on the cirque bottom, while before 1940 such relationship was not constant. This implies a rise of the snow-line by approximately 150 m, equivalent to a 1 °C increment, in line with the climatic trend recorded by other researchers. During the LI A climax of the 19th century, the remarkable volume reached by the glacier caused the rocky walls to emerge by no more than 50 m from its surface and this was particularly true for the upper basin; the snow capture was therefore limited to the lower area of the glacier (photo 4). High above, the disturbance introduced by Corno Grande fore-peak was strong, resulting in the capture of part of the snow carried by the NW winds, evidendy prevailing in that period. There were also three grooves through which the snow discharged towards the glacier: Forchetta Sivitilli, Forchetta Gualerzi and another secondary groove descending from the East Peak. The first two remained active approximately till 1940, the third in LI A only (photo 3). Hence, in this phase the snow-line was clearly set at around 2750 m. Furthermore, considering the existence of some adjacent glacierets and the possibility for another snow field to exist in Val Cannella of Monte Amaro in Majella (GlRAUDl 1998), it appears that the glacier ELA could have moved as low as 2700 m, a value maintained for a few years only, otherwise the overflow over the cirque moraine should have been more substantial. In this maximum expansion period, the two cirques formed one single big feeding basin. The area variations of the glacier in the past centuries, till 1940, were rather modest. For sure Calderone must have disappeared at least once or, more likely, a few times since the end of the last Quaternary glaciation: indeed the glacier, as it appears from the archives photos, is nothing but the result of LIA neo-glaciation (Giraudi, 2000; Rovelli, op. cit.). Starting from the 16th century, the glacier was frequently described by hikers and climbers reaching the three peaks of Corno Grande. Such descriptions however, more aptly “impressions”, are often unreliable, vague and worthy only as proofs of the existence of the glacier. Irrefutable proofs of the variations of ice thickness are indeed the different shades of the marks left on the rocky walls by the trim line, caused by the differential alteration of the emerging rocks, a strong evidence of the quick glacial retreat since 1940. As far as iconographic documents are concerned (drawings, sketches, photographs), only few historical photographs give a technical outline. Particularly the frontal part is insufficiently represented. Unfortunately the time frequency is all but regular, which allows us to trace general trends only. This is particularly true for the period preceding 1929, before the glaciological campaigns by Tonini (1929-1960) and Zanon (1962-1979). As already stated, during the maximum Holocenic expansion of the LIA, Calderone’s dimensions were not sensibly different from those observed in the images dated to the end of 1800. The maximum thickness was around 80-100 m (70 m at Forchetta del Calderone); the glacier completely covered the big terrace of Torrione Cambi (photo 4) and overflowed from Forchetta del Calderone towards the walls hanging over Bivacco Bafile, while a sizable tongue emerged from the orographic left cirque, where now one can admire a big detrital- morainic slope plunging towards the Franchetti hut (2435 m). This breaking of pre-existing moraines was dated by GlRAUDl around 3950 BC (op. cit.) and is typical of another Mediterranean glacier: Picaho de Veleta (Sierra Nevada, Spain). The remarkable development of the ice thickness caused the feeding basin to reach the cirque ridges (photo 4). Under these conditions, the capture effect was voided, which proves that the snow­line (and ELA) was located at a much lower level, even if compared to the beginning of the 20th century. 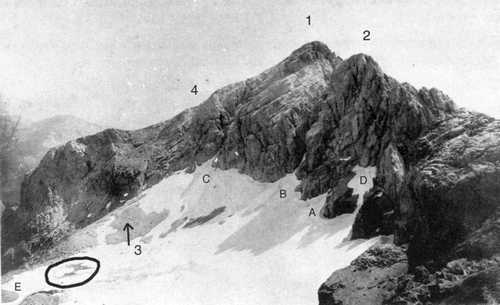 The natural concavity of the glacier was barely apparent, as the great development of the left side, almost reaching the Corno Grande fore-peak, was matched by the equally swollen right side, reaching less than 20 m below the highest peak.. Calderone’s edges were visible from Conca degli Invalidi and from the West Peaks of the group, since the ice extended as high as the ridges of the upper cirque. The glacieret of the fore-peak (photo 1, point C) was joined laterally to Calderone and the moraine delimiting its the right side (today in an advanced process of being washed away) represented a mid moraine between the two bodies. The sizes of all other glacierets in Vallone delle Cornacchie were conspicuous, particularly the one adjacent to the Franchetti hut. The first reliable images of Calderone are dated 22 July 1871. In the same images one can see a well fed glacier, with a much developed accumulation area, still reaching the West Peak ridges (photo 9). The condition of the front, however, cannot be estimated. Another very important picture is dated Aug. 1887 (photo 10). The glacier is enclosed by the glacial cirque and there is no trace of the external tongue, but two interesting details are visible: the three outer snowfields are ‘dll glacierets; the right morainic rib of the outer-upper glacieret is scarcely visible and it does not stand out as in later photos or in the Marinelli & Ricci map (1917). On this subject, one could argue that there must have been some buried ice in those days. In the photographs of the early 20th century, the ablation basin appears thinning, with a more evident lower concavity. At the same time, even the highest portion of the glacier are shrinking, with a definite loss of thickness after 1892. In 1887 some glacier edges still reach the Forchetta, but in 1905 the vertical gap between the glacier and Forchetta is at least 15 m wide. Later images confirm that the positions of the 19th century are lost, in spite of the progression of 1915 and 1917. In 1916 Calderone’s tongue still rests on the frontal moraine, but a nice moraine bar on the left, carved by the outlet channel, is documenting an expansion prior to 1887 photos 2, 3). No trace of this moraine is left, nor the morphology of the laid moraine resembles the present Layout. In the images by MARINELLI & Ricci, some glacial tables are apparent, as well as a water pond which would later turn into Lake Sophia. Other 1924 photos show a deeply crevassed glacier, with a still consistent thickness and a right margin well detached from the walls. In the 30s’, the glacier does not undergo significant changes, as snowy years, favourable to maintaining the glacial balance, follow very negative years (1935, 1937). 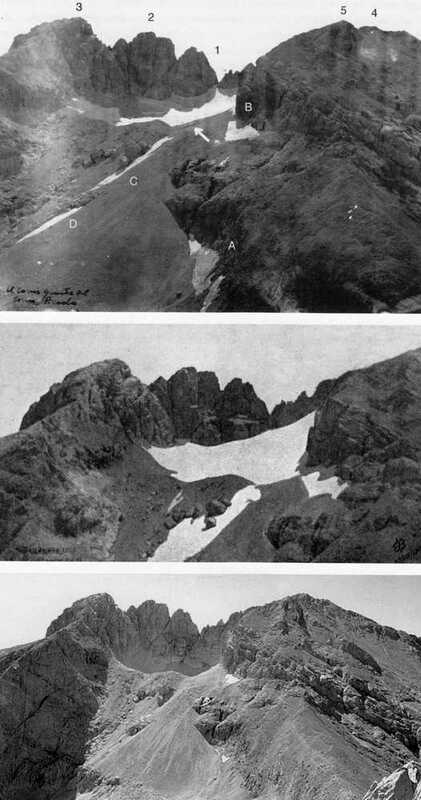 Specifically, 1932-33 winter and the following spring mark quite a positive year for the Calderone: July 1933 images show a glacier still covered by a thick snow mantle, extending also to portions outside the glacial cirque and almost reaching 1871 levels. However, the small size of the glacier makes it sensitive to annual or inter-annual climatic changes. Hence we observe that snowy winters may evolve into very negative years if followed by torrid summers, as it is often the case in the Mediterranean area: the plentiful 1933 snowfalls were wiped out in 1934, even more so in 1935, both dry and hot years. In 1935 deep crevasses cross the glacier, the ice flow direction is evidenced by a wide, elliptic shaped shading. Debris start to collapse on the hydrographic left, accumulating in the lower third of the glacier. In the Forties, Calderone dramatically withdraws from the advanced positions of 1940, when minimum distances were recorded from the marks set by Tonini in 1934. 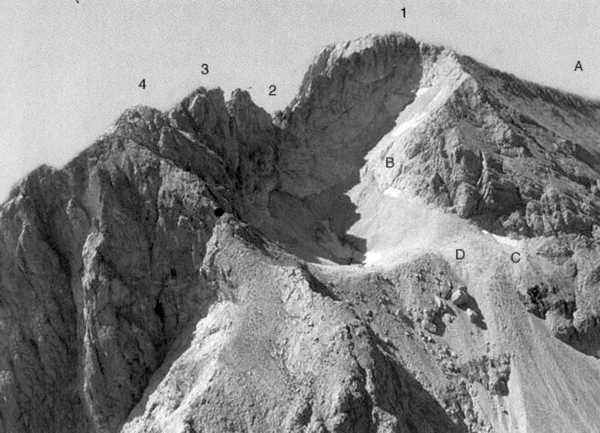 In the 1945 (R.A.F) and 1946 (Tonini) images, a rocky window emerges from the left, which is simply the still hidden threshold edge of the upper cirque. In this phase, such upper edge, unprotected by rocks, withdraws faster than the right one. Between 1946 and 1954 it is submerged by debris and the median concavity becomes more and more evident and crevassed. In 1947 Calderone hosted a movie set. In a panoramic scene on the snow-free glacier, large crevasses can be seen on the hydrographic right at the slope change, while the left side reached a level similar to the future 1983 level. Lake Sophia appears well developed, surrounded by snow banks that prove a consistent frontal accumulation. The 50s’ start with snowy winters (1950-51), but the following summers destroy the accumulations, especially between 1952 and 1956, when Calderone withdraws dramatically, settling into the inner cirque, becoming covered with debris and showing consistent debris-flow, particularly along the hydrographic left edge. The hydrographic right side also withdraws, with a greater linear retreat than the left side. Exactly in this period, the glacier shifts its course from left to right (though in 1949 the shift is still minimal). Only the upper left and central basins have recovered some volume, reaching the same levels of 1934, but these are the last additions, as the whole glacial body is now deeply altered. From 1962 to 1979 the surveys are carried out by G. Zanon, who runs measurements almost every year, gathering valuable and significant info. 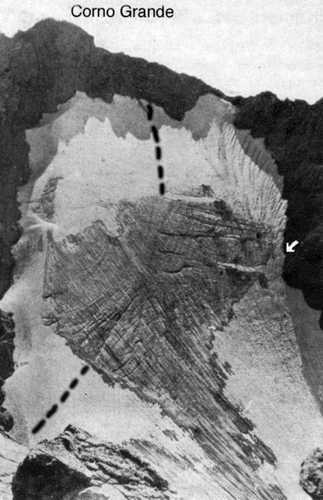 Such documents prove that in the early 60s’ the glacier is substantially stable, till 1964, when it suddenly loses almost all the mass gained between 1958 and 1963, losing 16 m of thickness at signal N.6 (left side) in one year only (Zanon, 1964). Nevertheless, the 60s’ do not contribute significantly to the shrinking trend of Calderone, as the second half of this decennium brings some recovery: indeed, comparing 1960 – 1970 images, no changes are apparent, save for a 4-5 m withdrawal of the right upper side. A hard blow strikes the glacier in 1974, when the central body appears totally naked and depressed in the central area close to the rocky window, pointing to the future break up into two independent units (Zanon, 1974). On the sides, extended debris flows cover the lowest part of the glacier. During the 1979-1980 surveys, the whole ice body is fully covered by snowfields thick enough to match, on the left side, the levels of the early 50s’, while right-side levels remain below those of 1960. Zanon (1979) records a 17 m thickness increase on the left side, based upon comparisons with 1964 (signal N.6); the gain has occurred in the last 5 years. In 1981 the last withdrawal phase begins, interrupted only by few episodes of good snow accumulation (1984, 1986, 1991), not sufficient however to reverse the negative trend. From 1983 to 1994 the upper right side loses more than 10 m of ice, while the left side loses its characteristic striped and crevassed swelling. From 1983 onward, with the exception of the years mentioned above, Calderone is showing continuously decreasing snow cover. Thus, for about twenty years, the glacier is left without multiannual feeding; the upper basin shrinking more and more, getting covered with debris fallen from the surrounding walls, thus becoming a debris covered glacier (Smiraglia, op. cit.). From 1987 to 1992 the accumulation area ends its function, figuring only as an ice mass with no interaction with the main body. In 2001 Calderone splits into two units, having already lost the morphologic and dynamic factors of a glacier: it can now be called a glacieret, whose thickness diminishes about 1 m/year (Smiraglia, op. cit. ; PECCI et al. op. cit.). The last crevasses, always in the mid-lower part, have been recorded in 1994 (Pecci); in this year the glacier appears deprived of any trace of residual snow and heavily covered by debris-flow. In the following years, the reduction of the former collector basin proceeds quickly, resulting in a lengthened ice mass incessantly covered by huge amount of debris of different size. Photo 5: the glacier by the twenties’ end Crevasses are evident. The dotted line marks the border between the two feed ones; also apparent from the shading. The arrow points to the N.6 signal position. Accumulation from capturing on hydrographic right and from lee on left is evident as well as the size of upper circus collector basin. (CAI, L’Aquila). 5.4 – The New Century: from 2001 to the presentStarting from 2003, practically no trace remains of the upper sector of Calderone, while the lower part sinks into the debris, whose thickness ranges from 5 to 150 cm. Even the snowy 2003-2004 and 2004-2005 winters have not contributed positively to the glacieret. At the end of the 2004 season, the surface of the former glacier is almost entirely covered by morainic debris, while irregular heaps of recent snow are located in few sectors of the lower basin and below the Corno Grande peak. The ice surfaces in the lower centre part only. Still well visible is the sinkhole swallowing the stream, while the snowfield that each year builds up in the inner side of the front moraine often lasts till Autumn, in spite of its unfavourable southern exposure. The persistence of this snowfield proves that the ice accumulation in the moraine’s inner core is still remarkable. Outside of Calderone basin, the snowfields, already glacierets in the 19th century, are no longer persistent, but simply seasonal, sometimes multiannual snowfields with no ice core, that grow up and disappear independently from the main glacier. Since 2003, the two Calderone cirques turn into ice-bearing sites, with a medium size ice core in the lower cirque and some extremely small ice remains in the upper cirque. Since the early reports, many authors have tried to explain the existence of Calderone through the analysis of the climatic characteristics of that area (Tonini, 1934, 1960; Gellatly et al., 1994), but the difficulties in evaluating the data coming from near-by weather stations, all located at sites unfit for reliable comparisons, led to uncertain results. In his 1961 research, Tonini correlates Calderone variations with the current behaviour of the local climate, arriving at non exhaustive conclusions, due to many factors: firstly, all the surveys (by Tonini first, then by Zanon) were carried in August and September, which are still summer months for the Apennine . Secondly, the absence of a meteorological station coherent with the glacier’s climatic environment made it necessary to interpolate the data from adjacent stations. For this reason, the reliability of Tonini’s climograms do not exceed 50 %. The stations examined by the Author and by other researchers have evidenced a low vertical thermal gradient between the sites of Gran Sasso (L’Aquila, Isola del Gran Sasso) and the highest sites (Campo Imperatore, Pietracamela). The reason is the closeness to the sea and the absence of an orographic barrier between Gran Sasso and the Adriatic sea capable of stabilising the turbulent air masses coming from the sea, coupled with the vertical shapes of the mountains, such as the great calcareous wall of the Corno Grande East Peak. This feature has a particular effect in the summer season, when the general air circulation abates and local turbulence prevails, with scarcely differentiated air masses standing still both vertically and horizontally: in this way the snow-line has remained all the time above the elevation inferred by the average temperature of the > jrvey stations. At Pietracamela station, 1000 m a.s.l., the average yearly temperature is between 8,9 and 12,6 °C, responding to a 2500 to 3100 m snow-level if the mean gradient value were to be 0,6 °C/100 m.
I n such a situation, the glacier extension would be much greater, even larger than the maximum size at the LI A : imax. In our case, the low gradient has prevented any glacier development and the snow-line has reached ilderone mean height (2780 m in 1934) only when Pietracamela average temperature was below 8,9 °C, which •ccurred in few years only. Yet another interesting fact emerges when comparing Pietracamela and Campo I Tiperatore stations: the thermal gradient is not constant but varies greatly with the years. This fact clarifies why rather warm years, such as 1978, could turn into a positive year for the glacier, ‘ndeed the temperature difference between the two stations (1030 vs. 2130 m) varies between 5 and the 8,63 :C recorded in 1978 (values corresponding to 0,45 and 0,78 °C/100m respectively) and explaining the unusual ‘now coverage of 1978 at sites beyond the glacier as well. Of course these data are not absolute and should be cross-compared with the precipitations and with other missing data, such as the wind regime during snowfalls. Unfortunately, the chimney effect of Corno Grande interferes with a reliable data collection: thus one is forced to use more or less accurate interpolations. Analysing fig. 4, it appears that Calderone underwent long periods of shrinking, interrupted by few consecutive positive years producing a real progress . The longest and most effective expansion years of the 20th century were 1916-20, 1957-61, and 1975-80, while the worst regression years were 1942-49, 1981-2004. Let us now consider two typical years as far as glacier balance is concerned: 1973-74, 1939-40 (fig. 3 and 4). The first year was one of the worst, the second one of the best. Comparing the graphs of the climatic trends at the reference station, Pietracamela, closely correlated to Calderone, one can notice the difference between the two years: in the 1973-74 hydrological year, autumn falls were scarce and winter falls even more so, while April recorded 222 mm of precipitations, associated however with a 7,9 °C average temperature, hence a 0 °C altitude of 2400 m. The summer was dry and hot and by September Calderone was completely without snow and definitely shrinking. Year 1939-40 had a cool, humid autumn followed by a cold, snowy winter. Spring was cool and humid, 268 mm precipitations in April, hence more snow on the glaciers. The following summer was cool and dry , except June which recorded 280 mm of rain and occasional snowfalls at higher levels. July was the hottest month , with a mean temperature of 18,3 °C only, corresponding to approximately 9 °C at 2800 m, the glacier’s accumulation area. 8 photographs of March 1940 (Landi Vittori archive, CAI Rome) show a snow covered Vallone delle Cornacchie, with large spots uncovered or covered by a few centimetres of snow, such as the entire morainic apparatus beyond Calderone. Other photographs show a much thicker May snow coverage, with uniformly covered slopes and signs of recent April snowfalls. distinguish if the number of rainy days has increased or the average intensity of each single event has increased. The significant distance between Calderone and the Alps, with consequently different climatic characteristics between the two areas, might lead one to think that the dynamic phases of our glacier are independent from the Alpine ones. On the contrary, fig. 4 shows that Calderone trends are matching Alpine trends, both for positive and negative periods. Moreover palaeoclimatic researches confirm that a strict time-correlation exists between positive and negative cycles in the post-glacial era (GiRAUDi), although the two phases cannot be perfectly parallel, since the masses’ inertia are definitely different. In particular, the progress with its maximum in 1940, defined by Tonini as “the year of minimum distance from signals since 1934”, coincides with a transient progress of Western Alps glaciers, particularly for Mount Blanc. The 1958-60 progress also is a forerunner of the general progress that, in few years, will affect the great Alpine glaciers starting from the Western Alps, particularly from the Maritime Alps. On the other hand, the time alignment between Calderone, the Alps and the climax phase of 19th century is only an hypothesis. The external morainic apparatus of the glacier could have been originated in the maximum expansion phase of the first half of the 19th century, while the left and median moraines, 100-120 m behind the maximum, as shown in the images of 1887 and 1916 (photos 2, 10), point to a second phase of progress occurred around 1860. Should a morphologic association of Calderone with other apparatuses be found, one might point to the glaciers of Maritime, Giulie, Dolomites (Marmarole, Pale di S.Martino) Alps, of esalpic sides in general and of Eastern Pyrenees, with whom Calderone shared the same feeding and dissolution modes, while no commonalities are shared with the cirque glaciers of other Alpine mountain groups, such as the avalanche glaciers of Orobic Alps. 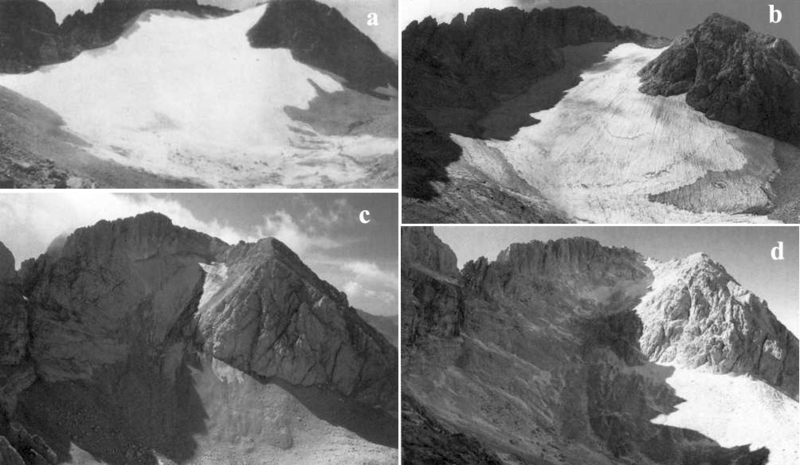 Nevertheless Calderone lacks the re-positioning phase of alpine cirque glaciers, or the attempt to prolong its survival by withdrawing from the sunny parts (particularly in the accumulation area) while preserving the shielded ones. Examples of these phenomena have been recorded in Orobic Alps (Cagamei), Brenta (Pra Fiori) and Dolomites (Cristallo, To fane). On the contrary, as reported, Calderone tried to preserve until the very last its sunniest side, giving up the better shielded ones, fit for snow capture, thus leading to an early end of the accumulation area. Generally, ice specialists tend to address the major glaciers to extract wide-scale information. Nevertheless Calderone Glacier represents an optimal research ground for glaciologists, thanks to its historical relationship with micro and macro-climate. The many studies carried out until now had not pointed out how this small cirque glacier could withstand a climate evolving more and more toward adverse conditions, incompatible with its survival. Since the LIA ended, hundreds of equally small and medium-size glaciers, Alpine or not, have not survived, disappearing before the great 20th century deglaciation. Hence, the true reason for its survival rests on its geographical location, oriented toward the Adriatic sea and far from the Tyrrhenian. We draw a parallel to the similar situation of the former glaciers of Picos de Europa in Cantabrica Cordillera, where glacierets survive at relatively low (2100-2400 m) altitudes, though in the LIA climax the small stratum and cirque glaciers were no bigger in size than Calderone. “Watching a snowfall in the mountains, one notes that the snow does not fall vertically, but in a skewed direction forced by the wind, always present in this environment. Now, consider a mountain wall hanging over a cirque facing the wind direction; the snow will be cast against the wall and will stick to it. (..). In this way, the walls capture the snow which is then piled up at their foot, forming a mass sometimes reaching the walls edge” (Porro, C, 1931). 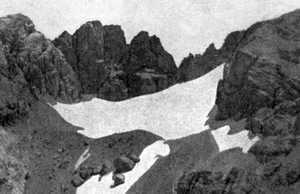 it appears that the change in slant immediately above the hidden threshold of the upper cirque was hardly visible until 1934, however a definite error can be detected in the topographic survey of 1958, where the contour lines point to a glacier resting again on the right, quite in contrast with the evidence resulting from the photographs taken in the same year. Clearly the 1958 survey did not report the new contour lines distribution but showed that of 1934. ‘ since approximately 1940-45, the huge moraine apparatus intercepts important snow accumulations in the most depressed part of the cirque, thus interfering with its feeding: this contributes to the negative balance of the glacier. The internal depression, now reaching 60 m, caused a limited thermal inversion favouring the permanence of snow and ice throughout the summer months and originating the small ice overlays frequendy found by the end of the summer. As a final consideration, the remarkable increment of the moraine cover originates a discontinuity between ice and possible firn accumulation in past years, certainly favouring the melting of new snow and minimizing possibly positive balances. ablation period in the Apennines, at the glacier’s level, generally ends in the first half of October and only this period provides reliable data for the annual balance of the glacier. over 74 years of direct and indirect observations (1921-2004), there were only 25 positive years, 36 negative years and 10 stationary ones. According to data revised by the writer, from 1929 to 1960, the same period examined by TONINI and GELLATLY et al. (1994, op. cit. ), both the positive and negative years were 13. To these one must add 3 stationary years, that the writer believe should rather be added to the negative years. Thus, in the most favourable hypothesis, a 50-50 share of positive-negative years can be assumed, which is in conflicts with Tonini (op. cit. ), i.e., shrinking occurs in one out of three years. Moreover, yearly balances should be analysed individually: generally the shrinking effect overwhelms the expansion effect. For instance, the more than 20 m of snow accumulated in the five year period 1975-80 (the last positive phase) were almost entirely melted in the following two disastrous years (1980-81, 1981-82), to the extent that in 1982 the glacier had the same aspect as in 1974. Alberti Marchesi L. (1960) – ‘Note geologiche e glaciologiche sul Gran Sasso con particolare riferimento al Ghiacciaio del Calderone. Catania. Bollettino del Com. Glaciol. It. (1929-1979) – Relazioni annuali. Torino. D’Alessandro L., D’orefice M., Pecci M., Smiraglia G, Ventura R. (2001) – The strongreductionphase of the Calderone Glacier during the last two centuries: recunstruction of the variations and the possible scenarios with GIS technologies. Global Change and Protected Areas. Kluwer Academic Publishers, 425-433. Damiani A. V., Pannuzi L. (1987) – La glaciazione pleistocenica nellAppennino labiale abruzzese. Ill Nota: opportunità di precisazioni terminologiche, metodologiche ed introduzione di parametri morfometrici. Boll. Serv. Geologico d’It., n° 105, 75-96. F., Grove J.M., Latham R., Smiraglla C. (1994) – Recent variations of Ghiacciaio del Calderone. Abruzzi. Italy. Journal of Glaciology, Vol. 40, 135, 486-490. GlRAUDl C. (1998) – Nuovi dati sul glacialismo della montagna della Maiella. Il Quaternario 11(2), 265-271. GlRAUDl C. (2000) – Le oscillazioni oloceniche del ghiacciaio del Calderone — Gran Sasso d’Italia (Abruzzo — Italia). Il Quaternario 13(1/2), 31-36. GlRAUDl C. (2002) – Le oscillazioni del ghiacciaio del Calderone e le variazioni climatiche degli ultimi 3000 anni. Il Quaternario 15(2), 149-154. Landi Vittorj C. – Archivio fotografico CAI Roma. Marinelli O., Ricci L. (1916) – Il ghiacciaio del Calderone. Rivista Geografica Italiana, 23, 399-405. PECCI M. (2001) – The historical and iconographic research in the reconstruction of the variation of the Calderone Glacier: state of the art and perspective. Global Change and Protected Areas. Kluwer Academic Publishers, 505-512. Pecci M., De Sisti G., Marino A., Smiraglla C. (2001) – New radar surveys in monitoring the evolution of the Calderone glacier (Central Apennines, Italy). Geografia Fisica e Dinamica Quaternaria V., 145-150. Porro C. (1931) – La cattura e la conservazione della neve in montagna. Rivista mensile del C.A.I., 409-413. Rovelli E. (1985) – Sulle variazioni del ghiacciaio del Calderone. L’Appennino, 6-9. SMIRAGLLA C, Veggetti O. (1992) – Recenti osservazioni sul ghiacciaio del Calderone (Gran Sasso d’Italia, Abruzzo). Boll. Soc. Geografica It. Serie XI; voi IX, 269-302. Tonini D. (1961) – Il ghiacciaio del Calderone del Gran Sasso d’Italia. Boll. Com. Glaciologia) It., 71-134. Zanon G. (1962-1979) – Relazioni annuali campagna glaciologica. In Boll. Comit. Glaciologico. la foto che hai messo nel tuo sito non è di Marinelli e non è del 1917. Leggi la didascalia della foto nel mio archivio.